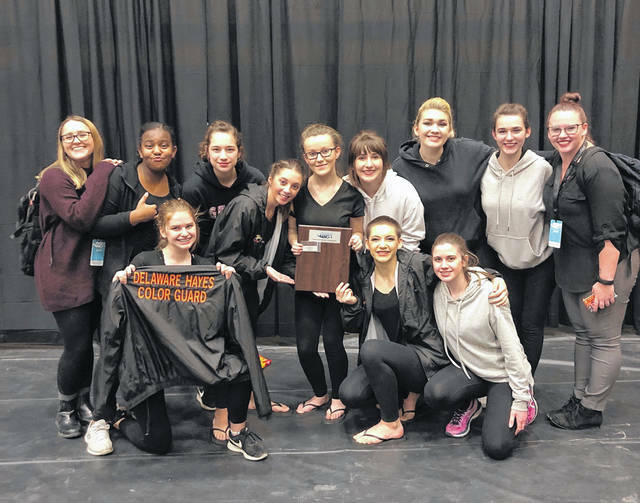 The Delaware Hayes Winter Guard competed for the first time in four years earlier this month and took home second place. The team’s coaches, Mackenzie Colgan and Alexis Graffice, competed on the team when they were in high school. They added the winter guard stopped competing because it didn’t have a consistent practice space. The pair said the 10 members of the team practice in the cafeteria at Dempsey Middle School after school for three hours several times a week, and they added winter guard is different than what most people expect from color guard performances during the football season. Graffice said every member of the guard has an important part to play in its show, “Underneath the Skin,” which was designed by Graffice and Colgan. During competitions, the winter guard is judge on equipment, visual analysis design, movement analysis and general effect. Colgan said the performances are about three and half to four minutes long. Colgan said the team recently travelled to a guard competition at Franklin Heights High School, hosted by Cap City Percussion, and the team came away with second place in its class. Graffice said she was proud of the team, and she added the show was designed to challenge the guard. The guard team’s captains, senior Rebekkah Costilo and junior Brittany Green, said they were pleased with their performance at the competition. Green said she was a little nervous for the next competition in March, but she’s excited to continue to learn the show. Conversely, Costilo said the pressure from the upcoming competition makes her work harder. “I thrive on the adrenaline of making things up as we go,” she said.